Dog sled race, mushing, the Iditarod dog sledding race, Anchorage to Nome, Alaska. Puppy Love – Iditarod sled dog. 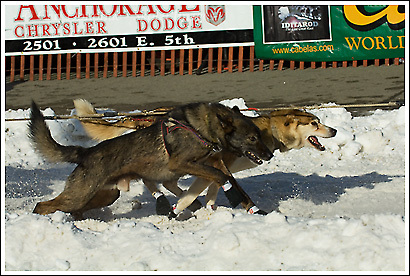 Here’s another from the start of the Iditarod in Anchorage, March 1, 2008. It doesn’t seem like that long ago, and here the month has flown by. I wanted to get a shot or 2 of some interaction between the dogs and heir handlers, but they were typically not in decent light. Finally got a few that I was happy with. This one, the handler knelt down to check the dog’s booties, and he got a face full of tongue for his trouble. Seconds later the starter said “Go”, and the dogs were gone! This entry was posted in Adventures, Alaska, Anchorage, Iditarod, News, People, Travel, Winter on March 22, 2008 by Carl D.
Sled dog racing, Iditarod, Anchorage, Alaska. 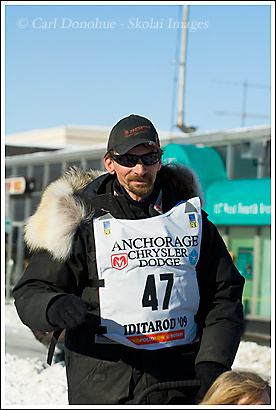 Another, possibly the last for now, from the Iditarod last weekend. The dogs can’t wait to get started, I swear its as if they count down with the starter, 10, 9, 8, 7, 6, 5, 4, 3, 2, 1 and they leap into the traces. It’s amazing to me to think that the leaders are over halfway to Nome already. A few years back I was fortunate enough to spend some more time with the race, a few days out on the trail, which was a blast. Maybe one year I’ll get out to Nome for the finish. Until then, I’ll suffice with the excitement of the start of the Iditarod in Anchorage. This entry was posted in Adventures, Alaska, Anchorage, Iditarod, News, Travel, Winter on March 6, 2008 by Carl D.
I know, I know, another photo from 4th street, downtown Anchorage. This was one of the later dog teams of the morning, towards the end of the teams, and they seemed mighty keen to make up for the late start. Right now they’re making their way across the frozen tundra of the Alaskan wilderness, and I bet they’re not quite pushing it as hard as they are here. 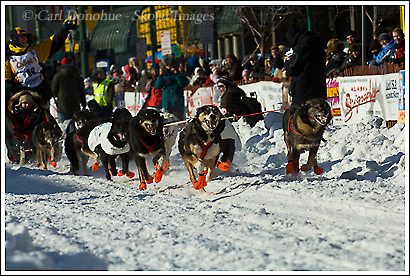 This entry was posted in Adventures, Alaska, Anchorage, Cool stories, Iditarod, Photo business, Photography, Winter on March 5, 2008 by Carl D.
Iditarod sled dog race, Anchorage, Alaska. 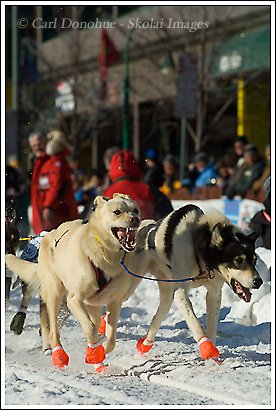 Here’s another photo from the Iditarod start in Anchorage on the weekend. You can see this leg is all in good fun by the costume. 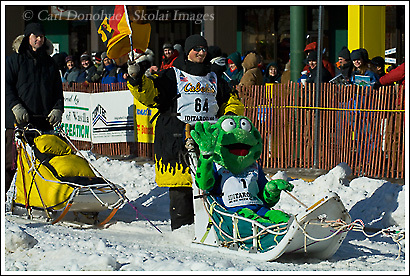 There’s no way that frog could make it all the way to Nome this time of year. About the same chance as my van making it to McCarthy and back. This entry was posted in Adventures, Alaska, Anchorage, Iditarod, Travel, Winter on March 4, 2008 by Carl D.
This entry was posted in Adventures, Alaska, Anchorage, Iditarod, Travel, Winter on March 3, 2008 by Carl D.
This morning I went downtown here in Anchorage and watched a little of the start of the Iditarod. 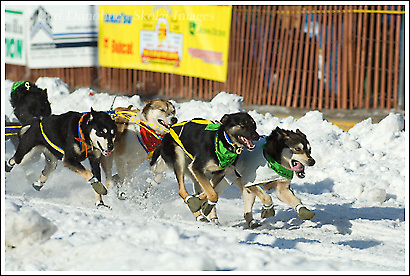 The sled dog race, known as mushing, runs from Anchorage to nome – well, pretty much. they actually do the “proper” start tomorrow, Sunday, in Wasilla, just north of Anchorage. 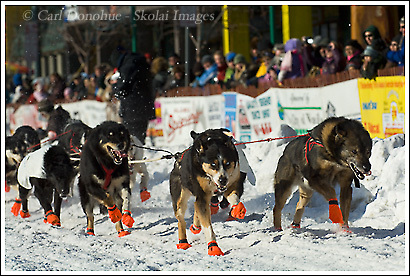 They race all the way to Nome, over 1000 miles away. Crazy, I say. It’s a treat to watch the dogs take-off — they’re so super-woundup, eager to run, the energy level is amazing. The din is pretty amazing down on 4th street too, with hundreds of dogs barking, howling, whining and generally causing mayhem. but once they hear “mush”, they’re all business, and off they go. Shooting photos of them as they race down main street is tons of fun. 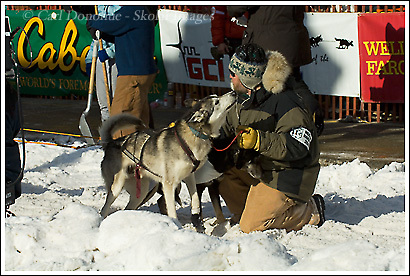 This entry was posted in Adventures, Alaska, Anchorage, Iditarod, Travel, Winter on March 2, 2008 by Carl D.